While I was out shopping the other day I decided to start a new series on the ol’ blog. Inspired by Young House Love’s Window Shopping series, I’m going to start taking y’all along on my shopping trips (virtually, of course). I’ll cover big box stores, thrift stores, small local shops, and whatever else I come across. I’ll share my favorite finds and what I bought (if anything). I thought this would be a fun way to share a little more of my design style…and to look a pretty things. Oh, and I should add that none of this is sponsored. Let’s get this series started with a trip to HomeGoods! I spotted this ginger jar as soon as I walked in the door. This one was $39.99, but it was pretty large. I’d love to find a smaller one in yellow (or white) for my mantle. 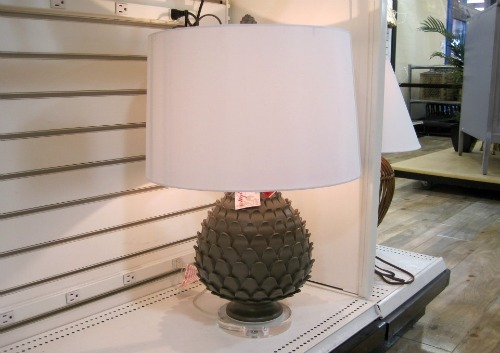 This artichoke lamp was on clearance for $39.00. If you’ve ever bought lamps before, you know that’s a great price since it also includes the shade. If there was another one, I probably would have bought them for the bedroom. I loved these pictures and the reminder to enjoy life and be happy. 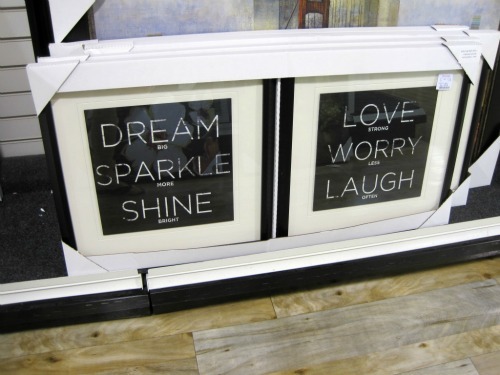 I’ve been pretty stressed the past few days, I should follow the message and “worry less.” $39.99 for the pair. Doesn’t this fabric look just like F. Schumacher Imperial Trellis? Obviously it’s not because this dog bed was only $39.99 and that fabric is over $100/yard. 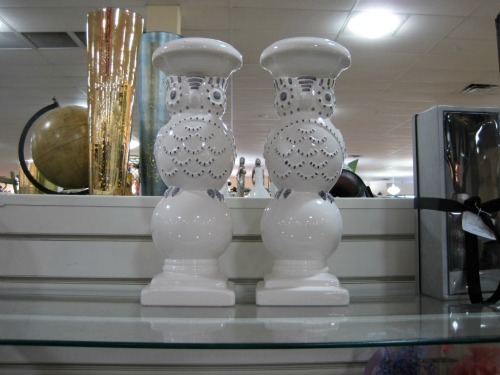 Add a little whimsy to the usual set of candlesticks with these owl candlesticks – on clearance for $12.00. 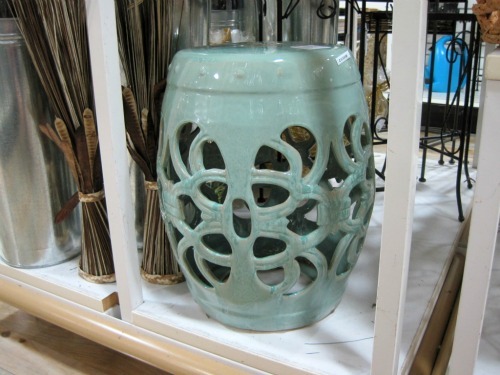 I loved this garden stool, especially the color, but I was feeling way too cheap to spend $69.99. Sigh, now I kinda wish I would have bought it. 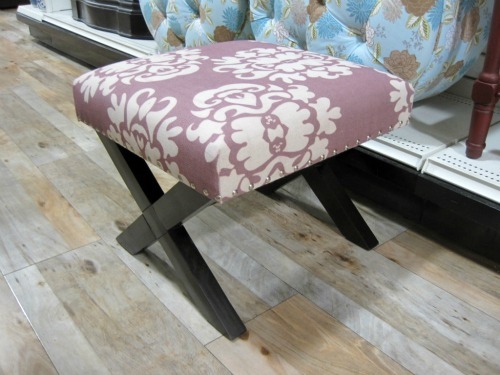 I loved the x-legs on this bench and the nailhead trim. It was $59.99. HomeGoods always has a huge selection of pillows. These were 3 of my favorites. 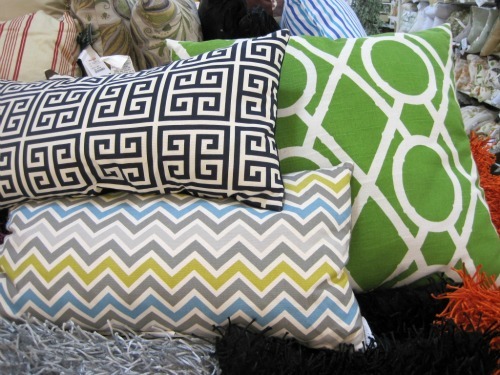 The Greek key and chevron pillows were $19.99 and the green one was $24.99. 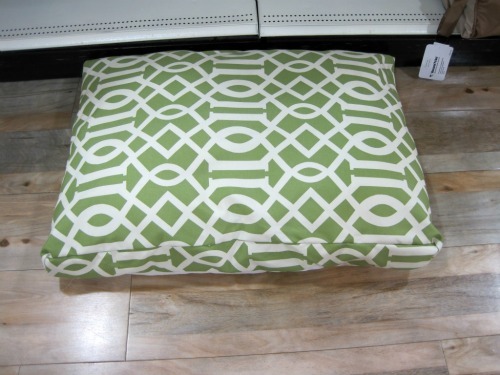 I came *this* close to buying the green pillow. It was large and fluffy, but I didn’t think it’d look good with the pillows I just bought at Target. 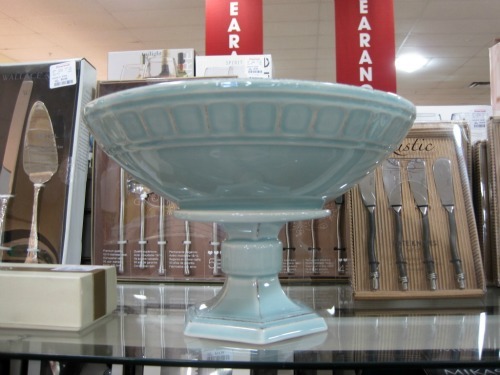 This pedestal bowl was $16.99 and would look cute on a kitchen counter as a fruit bowl. So, what do you think? Do you like the new ‘Shopping Trip’ series? What’s your favorite item from above? Do you shop at HomeGoods? Any recommendations for future shopping stops? Ha! I love your last line about being cheap! I'm a student so frugality runs it at this time. All of your finds provide great inspiration to look for and/or recreate on an even tighter budget! You've got a great eye for style! I came across your blog when visiting Brooke's. Love it!! But I like the things you found! We are finally getting a TJ Maxx with a homegoods in it where I'm at. Whooo! Can't wait! I love this new shopping trip idea! We don't have a HomeGoods anywhere near downtown Phoenix, but I did find one by my sister's house in Gilbert recently. I'm hooked...though I didn't buy anything, either. It's Pinterest's fault: now I think I can make everything myself for cheaper, whether or not I really can. I found your blog through Young House Love and am loving it! I am a Homegoods junkie, too. You can find ANYTHING there if you wait long enough. 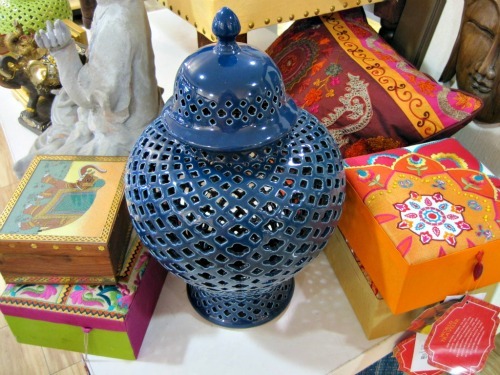 I go to expensive stores for ideas, then wait for Homegoods to have it! What? You did not buy at least one item? Haha! If I were you, I would have bought at least one item from every shop I went to. :P I think, the messages in the frames were worth buying. Also, it would be nice to at least do two shots for each product, on different angles. I’m curious, what is that product that you can’t resist to not buy, considering its expensive price?